Pinnacle Studio Plus is the one powerhouse video editor streamlined to help you quickly and easily create anything from your first movie memories to ambitious movie projects—without an engineering degree. With Pinnacle Studio Plus as your creative partner, you’ll spend less time making videos and more time sharing them. We’ve included an extensive collection of video tutorials from the training experts at Class on Demand, designed to get you creating movies like a pro in no time. Whether you’re just getting started or wanting to enhance your skills, it’s as simple as going online or popping in the included “Getting Started with Studio” DVD. Import your videos and photos manually or automatically from virtually any device—camcorders, digital cameras, webcams, tablets, mobile phones, handheld audio recorders, and more. You can even import 3D clips from cameras like GoPro and formats like Panasonic MVC. Pinnacle Studio Plus also supports tape-based3 and analog devices3, and even audio files in 5.1 surround format. Pinnacle Studio Plus features integrated cloud access so that your media files and projects are always handy, no matter where you are or what you’re doing. Project Packages lets you bundle together all of the media files related to a given movie, taking the work out of organizing and assuring that you always have all the files you need. You can even start editing projects on the go with Pinnacle Studio for iPad1, then transfer them to Pinnacle Studio Plus for polishing. We’ve thrown in 50GB2 of free cloud access from Box to get you started. With the built-in media library, it’s simple to organize your favorite video clips, photos, music, and other creative elements so you can easily find and reuse them in various projects. Tag and rate your media files, as well as group them into categories for even faster access. You can even correct and enhance your source media right inside Pinnacle Studio Plus’s media editor without the need for additional apps. Crop, pan-and zoom, and eliminate red eye from photos. EQ and clean up noisy audio. Color-correct video and stabilize shaky footage with Hollywood-proven technology. The changes and effects you add to your files in the media library apply whenever you use them in a project or export them for other uses—saving time and streamlining your movie making. With 24 tracks, Pinnacle Studio Plus lets you create sophisticated picture-in-picture and multi-layer effects in HD or 3D—just like a Hollywood pro. Frame-accurate editing gives you precision control over how you tell your story. Pinnacle Studio Plus displays source clips and your timeline edit preview simultaneously for intuitive flow. You can set source clip trim in/out points, then drag trimmed clips right into the timeline for fast precision editing—just like the pros. 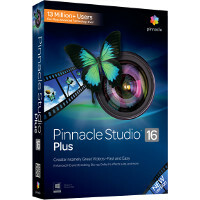 Pinnacle Studio Plus gives you the flexibility to make movies the way that best suits you or a given project. For instant results, drag-and-drop your desired media elements from the library into SmartMovie or SmartSlide to automatically make great videos—complete with music. You can also use Storyboard mode to easily create first drafts and visualize how your story will unfold. At any point, you can switch to the timeline for more traditional and precise editing. It all happens at state-of-the-art lightning speeds thanks to optimization for the latest acceleration technologies like 64-bit operation, NVIDIA CUDA, and Intel Quick Sync Video. From importing to editing to sharing, Pinnacle Studio Plus puts the power of industry-leading, Hollywood-proven stereoscopic 3D technology right in your hands. Import 3D video clips from sources like GoPro 3D cameras and Panasonic MVC format. Edit in various viewing modes, add true 3D effects, and enjoy the best quality with NVIDIA 3D Vision optimization and exclusive GeForce support. Export to YouTube 3D, AVCHD 3D, and more for viewing on 3D HDTVs, Sony PS3, and other 3D devices. Pinnacle Studio Plus even lets you mix 2D and 3D in the same project. Pinnacle Studio Plus also has advanced stereoscopic 3D features you won’t find anywhere else, like editing 3D in the timeline just like HD. Our partnership with NVIDIA allows exclusive NVIDIA 3D Vision display in both full-screen and window modes. View 3D on dual monitors and export “side-by-side” formats recognized by most 3D HDTVs. Auto-color correct for both eyes and control stereoscopic 3D depth (parallax effect). When you’re ready to go 3D, Pinnacle Studio Plus has everything you need. Add excitement and polish to your movies with over 1800 2D/3D effects, animated titles and transitions. Keyframe-based control gives you precision timing over how your effects, titles and transitions move. The included Montage templates provide preset themes—weddings, sports, holidays, sci-fi, comics and more—for instant professional results with just a few clicks. You can customize Montage templates for exactly the look you’re after. Use stop-motion capture to create amazing animations and fast-motion effects like you see on the big screen. Pinnacle Studio even lets you superimpose people you’ve shot in front of a green screen over different backgrounds. No movie is complete without a soundtrack. Pinnacle Studio Plus lets you add music with the included Scorefitter library of royalty-free sounds and songs—and they even automatically adjust to fit the length of your movies. Of course, you can also import tracks from other sound libraries or add your own original compositions from Avid Pro Tools or other music creation software. When you’re ready to share your videos, a single click in Pinnacle Studio Plus posts your HD and 3D videos on Facebook, YouTube, and Vimeo. You can also easily create DVDs and AVCHD discs, as well as author Blu-ray discs complete with Dolby Digital 5.1 surround sound. Export to popular formats like Adobe Flash FLV, MPEG-4, and DivX, as well as popular devices like Microsoft Xbox, Sony PS3, Nintendo Wii, Apple TV and Apple iPad. With Pinnacle Studio Plus, the world is your screen.